When I worked at the newspaper, one of my favorite parts of the job was coming up with story ideas. Like I said in my last post, I'm always on the lookout for weirdness in the world, and working as a journalist allowed me to put that weirdness to work. Since I was an editor, I worked in an office all day where weirdness abounded, but not so much story ideas. The one time of day I found inspiration was on my drive to work. Before moving to the 'burbs I lived on a farm and had a 25-minute commute down back roads full of people that my husband would say "have been left alone too long." These are the sorts of people and places that make the best characters and settings whether you're writing an article or a fictional story. One of my favorite finds was a little old lady who decorated the wire fence alongside the road with old bottles, bows, cans and other various objects that the rest of the world might call trash. I later interviewed her neighbor for a story -- he was not as amused by her self expression. Now that I work from home, my daily commute to the kitchen table doesn't offer much inspiration (the dirt-encrusted kitchen floor does inspire me to want to clean it ... someday). So I sort of invented a daily commute: The afternoon walk. Of course, as pictured, it doesn't necessarily afford me much alone time. 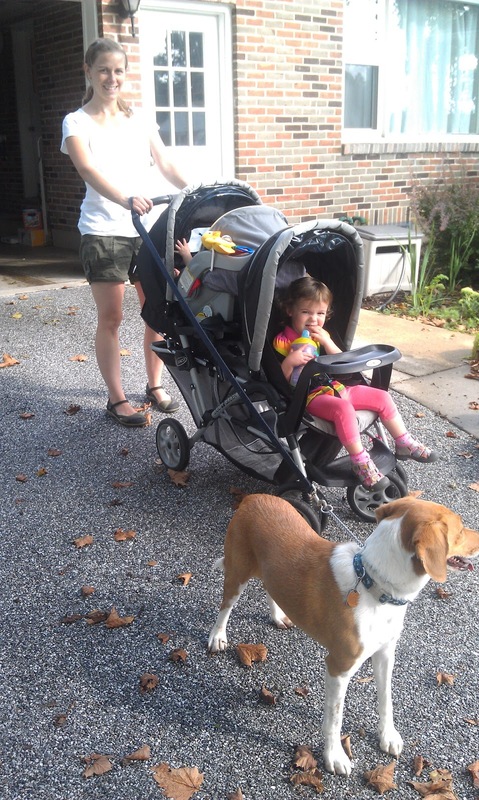 Maneuvering a double stroller while a deceptively strong 35-pound beagle mix drags me down the street doesn't allow for a lot of meditation or introspection. Especially when I must also ensure that said dog doesn't leap in front of every. Single. Passing. Car. 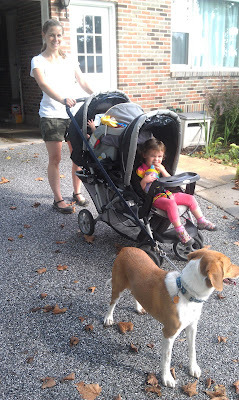 Seriously, the dog is pretty awful on the walks. So awful in fact that a neighborhood dog trainer turned his car around in order to stop us and hand me his business card ("I see your dog pulls a lot") True story. I also walk past said dog trainer's house every day. Also, a true story. Me: "You want me to sing 'Doc McStuffins'?" Me: Sings the theme song to Doc McStuffins. Me: Sings the theme song for "Phineas and Ferb"
In between the serenading and the cursing of the dog, I am allowed a few precious moments of thought and observation. I vow not to let Lily watch so much Disney Jr. I try to enjoy the fresh air and the breeze rustling the leaves of trees arching over the street. I covet my neighbors' well maintained, flower-ful and weed-free gardens. I often think about Eleanor because a walk very much like mine with a spirited dog that is eerily reminiscent of Snacks through a neighborhood that is remarkably similar to my own, is what lead her to the dead man. 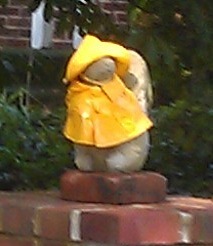 Stone squirrel in rain gear. And I look around to see what's new or different. I'm so impressed with the homeowner's devotion to these squirrels. I like to imagine a closet set aside with the squirrels' wardrobe hanging on miniature hangers and categorized by season. And I invent characteristics and habits for the woman who dresses up the squirrels (I've never talked to her ... I kind of like it better that way). She obviously has a sense of humor, but she's also probably fastidious -- given the care she uses for squirrel clothing choices and the "no dogs on the lawn" sign stuck in her front yard. I think she and her squirrels will show up in some story down the road. A couple of blocks later is my other favorite spot: The house with the crazy kids. The crazy kids haven't been out a whole lot recently, which is sad -- because they rarely disappoint with the strange, potentially dangerous things they do. Their front yard is constantly covered in sports gear and various wheeled transportation - skateboards, bikes, scooters, etc. I often find the oldest boy practicing bike tricks in the middle of the busy street during what amounts to rush hour in my neighborhood, or balancing a sibling or friend carrying fishing poles on the back. One time I had to move out of the way as he attempted to push a barbecue grill down the sidewalk ("Someone was going to throw it away!" he told me). I'm sure his mother was thrilled. The girl is friendly and chatty and always says hi, scratches the dog and coos over the girls. They're the type of wily kids who define what childhood should be about: being outdoors, getting dirty, running around and making (a little) mischief. They're definitely showing up in the book. And there are plenty of other characters: The sinewy guy in the lime-green shirt who runs laps and laps around the neighborhood; the old couple who walk back and forth down my street, always holding hands; the people who's Christmas decorations are still littering their lawn and fence; the woman who walks her two little dogs (Barney and Betty) and picks up trash along her route. All the singing and barking and pulling and sweating are well worth the payoff. Sue! I have read your whole blog and love it! It's so great to read your writing - I feel like you're right here talking to me. :) You are an inspiration! I have been toying with blogging in some form but haven't settled on a topic - I also have a screenplay rolling around in my head that I'll have to tell you about someday. I am working on a reply to your email to but thought I'd write this comment while I have a minute.